Mama Shally is the mother of Zuleha and Mwidani Rashid. Her husband died of HIV and she was left alone to raise the children. 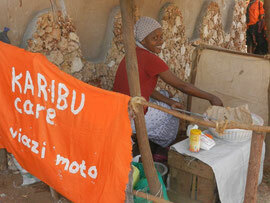 In January 2012 she brought the children to KARIBU care school to for admission. Zuleha has joined Kg1 and Mwidani Kg2, both they are very social and active. Outside KARIBU care school we have built a makuti roof and we decided to help Mama Shally to open a small business to sell viazi (potatoes) to the local people so she can be able to support her children. Today is the opening day and we wish her all good luck!